While growing up on a farm, I didn’t really understand the interconnections of agriculture. It did help me to appreciate the vital role that farming plays in the success of our economy, however. This is easy to understand, though: when farmers have a good year, so do the establishments they do business with. Farming is an economic engine for Central Minnesota, producing more than corn, pigs, soybeans, and poultry. Local farms fuel commerce that many other industries depend on. The effect agriculture plays was most visible in recent years, when weather was favorable and commodity prices were high. Many farmers purchased goods and services from their local machinery and auto dealers. They’ve upgraded and built new operational infrastructure such as grain storage and drying machinery. It’s easy to see that location matters in farming just as much as it does in many other businesses. 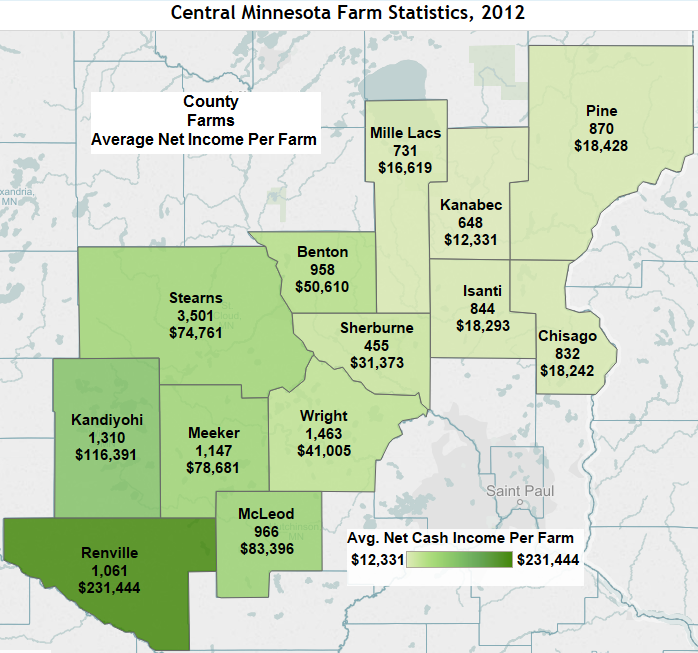 Net farm incomes vary greatly across Central Minnesota. It’s clear that the naturally fertile soil to the west has advantages for both crop and livestock producers. If you want more information from this farm kid on the agriculture industry in Central Minnesota, call me at 320-308-5378! Luke Greiner is the Central & Southwest Regional Analyst for the Minnesota Department of Employment and Economic Development. Featured Image courtesy of Little Visuals, licensed under CC 0 1.0.